Dog arthritis products can make your life easier and your dog with arthritis more comfortable. Knowing that your dog is happier and more active will put your mind at rest. Just making a few adjustments to your dog’s environment will make a huge difference for him. 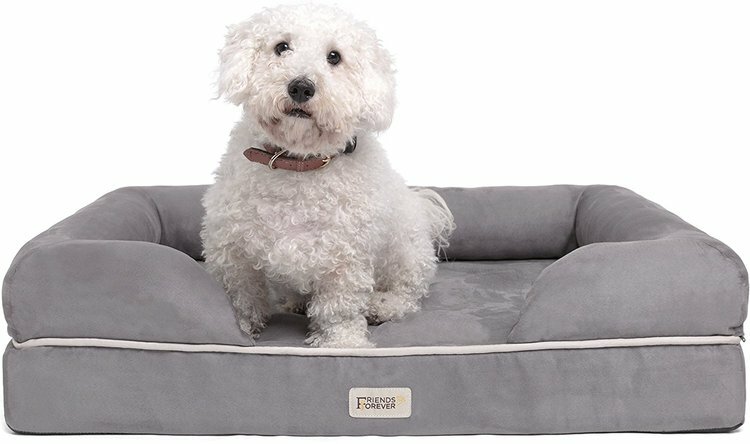 A good orthopedic bed will help your arthritic dog get a good night’s sleep! This one is available from Amazon. I’ll address this issue first, because your dog probably spends most of his time at home in your house or apartment. Making your dog comfortable includes keeping her warm and dry. Just like people, dogs who have arthritis are stiffer and more sore when the weather is rainy and damp. Just keeping your dog more warm will help him feel better. In cold weather a nice warm jacket or sweater can help your dog stay warm. You can find cold weather jackets for outside or jackets that can be worn indoors in fleece or knit sweaters. In addition, a self-warming bed or self-warming mat (reflects your dog’s own heat) can help keep your old dog’s bones limber. For night time use, consider getting an orthopedic bed for best support. Dogs with arthritis often have problems sleeping through the night and they may awaken and become restless with barking or whining noises. Older dogs with arthritis often have a problem jumping up to a favorite sofa or bed or jumping into the car to go for a ride with you. 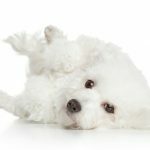 While it is easy to pick a Bichon up and place her where she want to be, dogs usually prefer to maintain some level of independence. An indoor ramp can help your dog access indoor areas and a car ramp, perhaps a folding one or a short length can help your Bichon get into the car on her own. 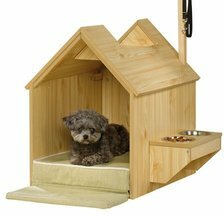 This cute indoor dog house has built-in raised bowls for convenient eating and watering. Available at Wayfair. While a ramp can prevent stress on your dog’s joints while move around, there is another issue that is easy to resolve. Dogs with arthritis in their spines or necks have pain when leaning down to eat meals or drink water. This is an easy one to solve. Simply provide raised bowls for your dog’s food and water. I thought the dog house on the right was a great set-up for an older dog. Your dog could relax in the house and get a drink easily without going very far. 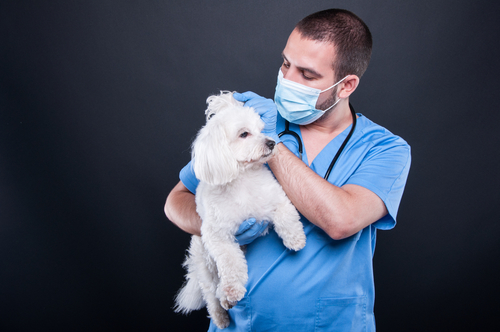 Of course restricted movement and pain are your Bichon’s main symptoms. You can help her out by getting a few simple pieces of equipment. Harness – This is really important if your dog pulls or tugs on the leash when you go walking. A harness takes the strain off your dog’s neck and spine. It also helps dogs who never learned to walk properly on a leash, walk without pulling. Dog Support Rehabilitation Harness – This is specially designed to help you support your dog when he has lost strength in his rear legs. You actually hold him up so he can walk. This is a great aid for people who simply can’t or prefer not to lift their dogs. Leg Brace – A brace on one or more of your dog’s joints can help give support to those joints and prevent sprains and injuries to a weak leg. You can buy leg braces for one joint or full leg braces for the whole leg. Jenny Dog Leash – This is a short leash that is designed to help you have better control of your dog while helping her feel safe and secure. Drag Bag – If your dog has been paralyzed, a drag bag can help her get around and also protect her chest and limbs. Sometimes it’s just easier to have your arthritic Bichon Frise ride instead of walk. 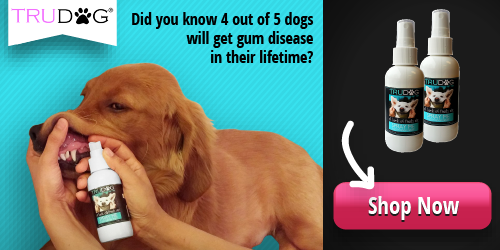 It gives you more options too, especially if you’re active and like to take your dog with you. Jogging strollers – These are great if you are a runner. Your Bichon can go with you, no matter how fast you go or how long you run. Make sure the jogging stroller you choose has good tires. Tires alone will make the difference between great fun and a nightmare. Have you ever gotten a cart or buggie at the grocery store with a bad wheel? Same principal! Small dog carriers – This is a good choice when you are going shopping or to an outdoor event. Your dog can go with you and she doesn’t have to walk. For some people who are not strong or who have low endurance, this will tire you out. In that case, you might want to consider a regular pet stroller. Bicycle carriers – always a fun way to take your dog with you. Wheel chair – If your dog’s arthritis has progressed to the point where he is paralyzed or completely lame in his hind legs, you might consider a dog wheel chair. This can bring life back to a Bichon who has been truly disabled. Dogs with arthritis don’t understand why they hurt and why they can’t do things that they used to do. It is confusing, and it can also make them anxious and sometimes a bit aggressive. So it will help your dog if you can help her stay calm. The iCalmDog provides music for dogs. More info here at Amazon. This is especially important if your dog already has separation anxiety. A dog who has experienced anxiety when you were gone, may feel even more insecure now that she is in pain and is failing physically. Comfort Zone Calming Vest – This is a dog vest that fits snugly and actually calms a dog. Based on experience like swaddling a baby who is fussy or calming a mental health patient who is out of control, the gentle pressure on the chest is very calming. Used for dogs who are afraid of thunder or fireworks, who are hyperactive or dogs with separation anxiety. The vest comes with a 90 day satisfaction guarantee, so you can try it out and if you don’t like it, just send it back. 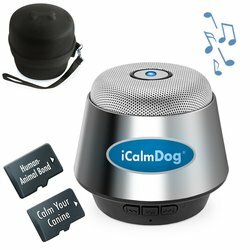 iCalm Dog music – This little music player plays music that is proven to calm dogs. It’s a great help for pet parents who have to leave their dogs alone or for dogs that are naturally anxious. If you prefer, you can get a CD or two from the Through a Dog’s Ear series that was developed to calm dogs. The CDs don’t last as long but you do have an assortment to choose from. The series even has specialty CDs for senior dogs and puppies. You may find that it is calming for you, as well. The Furbo Dog Camera helps you stay in touch with your dog, even if you are away from home! 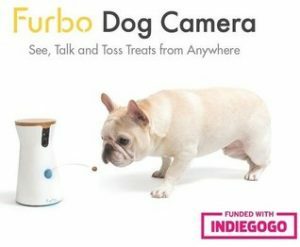 Furbo Dog Camera – This is really cool! Hook this up to your Alexa or Wifi, to keep track of your dog and what’s going on while you are gone. You will be able to see your dog and you can receive alerts on your phone if your dog is barking, chewing excessively, pacing or obsessively licking her feet. But, it’s even more exciting. You can talk to your dog to calm her down and you can dispense treats from the Furbo remotely. Calming Supplement – You may need a little extra help to calm your arthritic dog. These calming treats have a good track record for relieving dog stress and anxiety. With Skipper, we had to do some experimenting until we found a supplement that would calm her down for grooming. When your dog has arthritis, she is not as sure footed as she used to be. This is partly because of weakness in her limbs and her inability to right herself before slipping. I recommend that you try to make walking surfaces as slip-free as possible. Throw rugs should have non-slip backings. Double sided carpet tape can make your current rugs non-skid. Dog non-slip socks – Designed to prevent slips and falls on slippery floors like wood, tile or linoleum. These are also good for dogs who keep licking their feet because of allergies or anxiety. We tried boots with Skipper but could never get her to keep them on. Socks don’t seem to be as annoying to her. PawFriction – So what do you do if your dog won’t keep the socks on? PawFriction is an interesting solution to keep your dog from slipping. You apply a thin layer of adhesive to your dog’s paws and then a layer of non-skid granules. They stay on for a couple of weeks before you have to re-apply them. Non-skid tape – You can help your aging dog get a grip on your outside steps with non-skid tape. Just put a strip on the edge of each step. Finally, there are some supplements that can help keep your dog’s pain levels manageable. Glocosamine Chondroitin MSM – especially good for hip joints and keeping your older dog active. Krill Oil – good for joints but also helps skin and coat stay healthy. Good source of Omega 3 fatty acids. Turmeric or Curcumin – good for joints and just about everything else, including cancer. Salmon Oil – helps reduce inflammation and keep it under control.